RC helicopter controls are perhaps one of my favorite subjects to talk and write about. I truly love this aspect of the hobby; perhaps even more than flying because for many of us, understanding how an RC helicopter is controlled, and how they can even fly is captivating. Helicopters, both RC & full size are fascinating machines! The flight principles and physics that allow them to do what they do, and do so well really hits home while you are flying one. It still gives me goose bump moments after all these years. It's just one more reason (a big one), why this hobby is so awesome! I'm going to be covering the most common and basic questions I had when I was starting out in the hobby, and what my visitors have asked me about. It's all pretty easy stuff to get your head around so don't think this is going to be overly complicated. 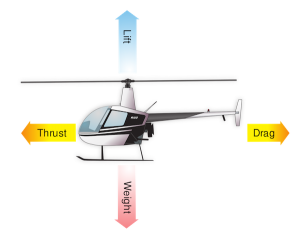 If you are looking for a more advanced and in depth explanation of the theory & physics of how helicopters fly, I highly recommend this FAA Aerodynamics of Helicopter Flight PDF. It's on the technical side but fairly easy to grasp, and well worth the read if you have a passion for helicopters like I do, and really want to understand the physics of what is going on in more detail. My goal on the other hand is to give you enough information to understand why an RC helicopter can fly and how we control it from an RC radio (RC transmitter). 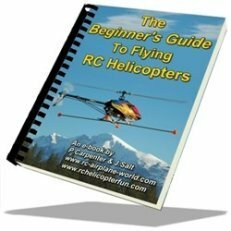 You must first understand these basic principles before you can learn to setup and fly an RC helicopter... it's that simple. Yes, now comes one of those times that your high school physics teacher warned you about. You know the old “one day, this information will come in handy” statement to make some attempt to keep us all awake. Didn’t work for me – how about you? So how will I keep you awake this time around? First, we are talking about something real here – your RC helicopter that you just spent a significant amount of time and money on. I think you will want to understand how it flies and how RC helicopter controls work – right? Second and as I already mentioned, this really is neat stuff! It the best part of the hobby as far as I'm concerned, and so many other RC heli pilots I have talked to over the years share that sentiment. So, lets start at our hands and the radio (transmitter). In the video below, I demonstrate how this mode 2 radio controls an RC helicopter. Now that we know how the radio imparts control movement to the helicopter, lets look at how these controls actually cause the helicopter to move around and fly. As I have said before, single rotor collective pitch RC helicopters are, at first, not easy to fly. They have the exact same controls and follow the same laws of physics as full size helicopters. The first step is to understand these forces and laws. It will then be an easy matter to understand how a helicopter is controlled. 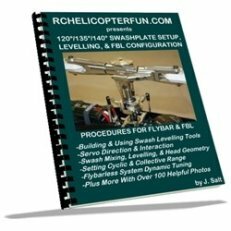 By fully understanding these three basic areas of helicopter flight, you will have a much better idea of how helicopters fly and understand RC helicopter flight controls much better. Like I said, this is pretty basic stuff, but you need to know it! 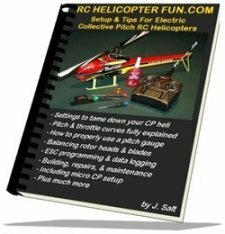 Here are also some videos explaining and demonstrating RC helicopter controls and basic heli flight physics. Now let’s look at two other areas of helicopter flight theory that are a bit more advanced. By understanding the first three, these two will make more sense. 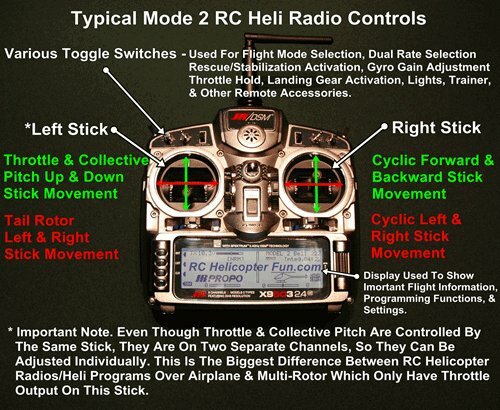 They are not crucial to understand, but it is nice to know they exist and how they affect the RC helicopter controls. Finally, here is an excellent training video going over all these helicopter controls on a full size Robinson R22 helicopter. 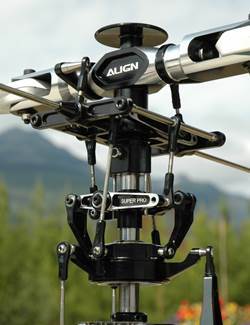 Even though it's full size, it shows the exact same control set that we also use on our collective pitch RC helicopters. So how did I do? Did I put you to sleep? Just remember, RC helicopters take time. If it doesn’t all make sense now, don’t worry. Come back to the explanation in a few hours or a few days and re-read it. Everything is more clear the second time around or as many times as you need. Simply visualize what is going on while your helicopter is flying. Unlike RC planes or cars, RC helicopter controls seem a bit abstract. You now know how a helicopter flies and how to control it. Visualize yourself in a nice solid hover. What happens if the heli starts drifting to the right? What control input do you give and what is happening on the helicopter to achieve the result from that control input? If you can think and visualize what your helicopter is doing before you even begin learning to fly, you will have a big advantage over others who learn by feel alone. Who said there was anything wrong with day dreaming. Have fun with the process.